The huge popularity of 3D movies in the Theater such as Avatar, Alice in Wonderland and others have created a demand for 3D TVs for the home. The newest 4K Ultra HD 3D TVs are capable of displaying high quality 3D content, with pictures rivaling those in the theater. 3D Ready 4K Ultra HD TVs have four times the resolution of Full HD, giving you a 3D picture to a new level not possible with a regular 3D HDTV. Samsung has discontinued making 3D TVs in 2016-2017. LG and Sony have discontinued making 3D TVs in 2017. **If 3D is an important feature to you, pick up one of the 2015 or 2016 3D models while they are still available. What is a 3D Ready TV? The 3D TV is the same as a normal HDTV set except that it has a built in IR (Infrared) or bluetooth transmitter to transmit signals to special 3D glasses. Another type of 3D TV that uses polarized glasses is a passive 3D TV. The 3D Ready TV also has special programs to process 3D programming, and convert 2D (regular HD) into a simulated 3D. There is now 3D content on Comcast, DirectTV, Blu-ray discs, PS3 3D games, and more (Comcast has 3D on Demand). Sports have become a big area for 3D, and ESPN has launched ESPN 3D which has introduced 3D sports programming including world cup soccer, golf, NBA finals, and more. Blu-ray 3D Players have now appeared that can give you full HD in 3D. **3D Glasses are not required to view regular HD programming. So even if you are not going to initially buy accessories (glasses and 3D blu-ray players), you can still enjoy your 3D TV as a normal HDTV for high definition programming. What’s new for 2016-2017 3D TVs? For 2016-2017, you won’t find many 3D TVs as Samsung has discontinued 3D TVs in 2016. LG and Sony discontinued making 3D TVs in 2017. 3D Ready LED HDTVs & 4K TVs – The most popular 3D TVs, are LED HDTVs. An LED HDTV is an LCD TV with an LED backlight instead of a traditional fluorescent backlight. LED backlights are brighter, improve contrast, and use less power than other HDTVs. Since the 3D glasses reduce some of the brightness of your view, 3D TVs increase the backlight to maximum. This is where LED TVs shine, as they are brighter than other backlight technologies. The best high end LED 4K TVs use Quantum Dots (Nano Crystals) for a broader color spectrum, brighter picture, deeper blacks. 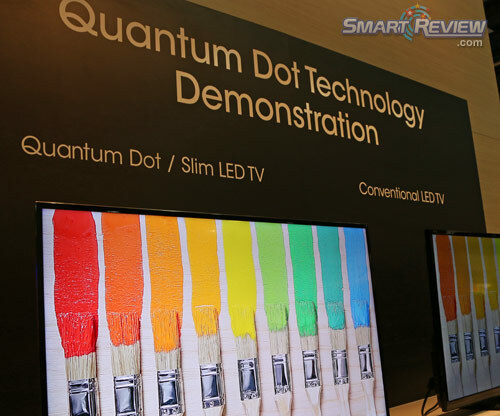 LED TVs are thinner and lighter HDTVs. Some are only 1.2 inches thin. What types of 3D content are available 3D content comes in three forms (the following pictures taken from our reference Sony HX800 3D TV). Frame Sequential Method – This has the highest resolution of all the 3D methods, but because of bandwidth issues, currently only 3D Blu-ray offers this resolution. The other methods listed below get converted into “frame sequential” but at a lower resolution than that of blu-ray. The picture of the frame sequential 3D method will have a double image appearance when not wearing 3D Glasses. When you do wear the 3D shutter glasses, the image will be crystal clear and be in 3D. Side-by-Side Method – Most 3D content from cable TV (such as Comcast), Satellite, On Demand, and 3D camcorders is available in what is called side by side 3D method. All 3D is achieved by giving each eye a slightly different angle. Just as we see in 3D naturally, the 3D pictures are from the same perspective as your eyes. The image to the left is what you will see if you have not set your 3D TV to the side by side method (available on your 3D settings menu). You also would see this if you tried to view this content on a 2D TV. What your 3D TV does is combine both images into one image that is compatible with your 3D glasses. It is converted to the same type of image as the frame sequential method above. The final image without glasses, will look somewhat blurry and have a double image. The active shutter glasses will make this image into a sharp, full 16:9 clear picture with the 3 dimensional effect. Over-and-Under Method – Just as the side by side method has the pictures to the left and right, the Over and Under method puts the pictures “Over and Under” each other. 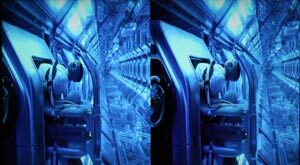 These images get combined by your 3D TV into one full screen frame sequential image. Just like the Side-By-Side method, this type of content is available on Cable and Satellite stations. What is a 2D and 3D? 2D (2 dimensional) is regular high definition programming. (no glasses required). 3D (3 dimensional) gives depth to the picture and requires 3D programming and 3D glasses. 3D content is actually two separate pictures, slightly offset from one another. The 3D glasses bring these together into one image that has width, height, and depth. Do I need 3D glasses to watch regular HD (2D) programming? No, 3D glasses are only required to view 3D content. Regular SD (Standard Definition) or HD (High Definition) programming are viewed just as they are on regular HDTVs without 3D glasses. There is a common misconception that a 3D TV is only for 3D content, but it is a regular HDTV with the addition of 3D. 3D Active Shutter Glasses – The most advanced 3D TVs use Active Shutter Glasses to create the 3D effect for viewers. They give you a full 1080p 3D picture. These work by the TV itself transmitting signals to the glasses to alternatively open and close each lens at high speed (they do this by making one lens opaque while the other is clear). This gives the viewer a look at the left image, then the right at high speed (many times per second). When this is done, a high quality 3D image is displayed on the screen. 3D TVs use either infrared or wireless bluetooth to communicate with the glasses. These type of 3D glasses use either rechargeable or disposable batteries. All Plasma TVs use the active shutter method of 3D. Passive 3D TVs & Glasses – Passive 3D TVs do not have active shutter glasses. Their glasses do not require batteries and are lighter to wear. They separate the two images by a process called polarization (like polarized sunglasses). 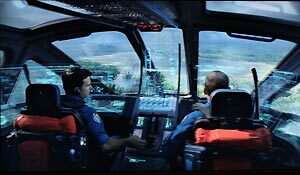 This is the same technology used in Movie Theaters for regular 3D movies (although IMAX uses active shutter technology for its 3D). The passive 3D glasses on these TVs are less expensive and provide a brighter picture. 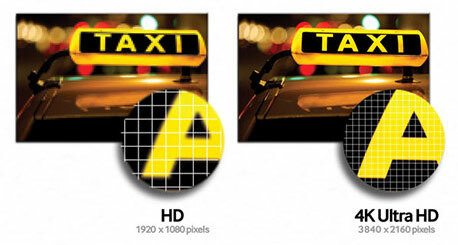 The disadvantage of passive 3D is that the picture resolution is lower than the active shutter TV & glasses combination. Off angle viewing is better with active shutter. Our experience with passive 3D is very favorable though, and the image seems to pop out of the screen more than that of active shutter glasses. Most passive 3D TVs provide many pairs of 3D glasses (4 pairs or more) with the TV. LG, Toshiba, Panasonic (LED TVs) and Vizio are making passive 3D TVs in 2013. Watching 3D video from your Camcorder Recently Panasonic, as well as Sony have introduced 3D camcorders. They record in the 3D side-by-side method (as mentioned above). To view the video, you can either plug in the camcorder’s HDMI cable to your 3D TV, or you may be able to upload the video to a Sony Playstation 3 and play it from that device. The current Panasonic camcorders (that take a 3D conversion lens) record at less than Full HD, while some of the dedicated 3D camcorders record at Full HD. How do you watch 3D content on your TV? When you are going to watch 3D content, you will press the 3D button on your remote control. This will let your TV know to start transmitting to the glasses and set up the TV for 3D content. If you are watching content from Cable TV, you will need to set what type of 3D programming you will be viewing. (Go to your 3D settings menu). Programming will be either Side-by-Side or Over-and-Under. (See desrciption above of these types of programming.) Once this is set, you are ready to go, just turn on your 3D glasses and enjoy. If you are playing 3D Blu-ray discs, you don’t need to set the 3D menu, as the menu usually is defaulted to this type of 3D content. Menu settings will vary from one manufacturer to another. For 3D, manufacturers recommend hooking up your TV with an HDMI (version 1.4) cable. The version 1.4 is made for 3D output. 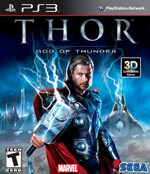 3D Compatible Games Game consoles such as the Sony PS3 now support both 3D Blu-ray movie discs, and 3D compatible games. Now you can play games on your 3D Ready set that have true 3-dimensional qualities for more realism. We expect more 3D titles to be introduced as 3D TVs grow in popularity. 3D Blu-ray Disc Players – In order to view 3D Blu-ray discs, you will need to purchase a 3D Blu-ray player, or Sony PS3 (they support blu-ray 3D). Blu-ray discs will give you the best 3D picture of any other source of 3D programming. There are a small and growing number of 3D titles available. We believe this will greatly increase as more 3D TVs are installed in homes.